Substantial progress in cutting greenhouse gas emissions, air and other pollutants, and improving energy and material efficiency, needs to be complemented by more actions by EU Member States to fully apply agreed-to policies to better protect biodiversity, natural resources, and people’s health. These are the key findings of a new European Environment Agency (EEA) report which reviews key trends and outlook towards achieving EU 2020 environmental objectives. EU environmental policies have delivered substantial improvements - Europeans enjoy cleaner air and water and more waste is being recycled. But more must be done to improve our air quality, protect our wildlife and natural resources if we are to meet our 2020 targets. It is becoming clear that we will need more integrated policies and knowledge to achieve our aim of living well within the limits of our planet. The EEA ‘Environmental indicator report 2016’ gives a snapshot of progress made so far by the 28 EU Member States in meeting a selected number of EU policy objectives. These are relevant to achieving the three key priority objectives of the EU’s 7th Environment Action Programme: natural capital; resource-efficient, low-carbon economy, and people’s health and well-being. The report complements ‘the European environment –state and outlook 2015’ (SOER) report. The 7th Environment Action Programme provides an overarching framework for EU environment policy planning and implementation to 2020. It also has a long-term objective of ‘living well within the limits of the planet’ by 2050. 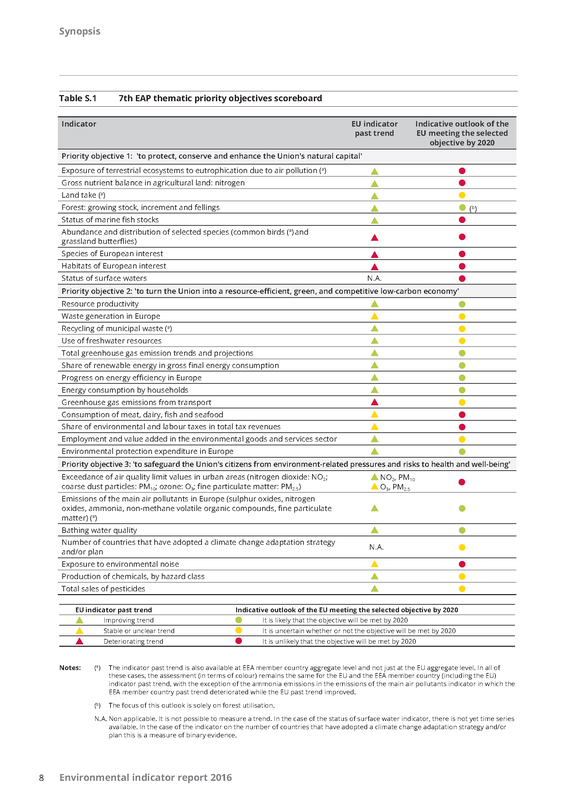 Progress on 29 policy objectives were assessed on whether they can be met by 2020. Individual briefings provide further information on these assessments, including country level information. Only about a third of the objectives are expected to be achieved while it is likely that another third will not be attained and it is uncertain whether or not the remaining third will be met by 2020. The report shows that EU environmental policies have been more successful on reducing pressures on the environment, improving efficiency and meeting 2020 climate and energy targets than on reducing overall impacts on people’s health and well-being or on ensuring the resilience of natural systems. “Our scoreboard shows that EU environmental policies have delivered substantial improvements - Europeans enjoy cleaner air and water and more waste is being recycled. But more must be done to improve our air quality, protect our wildlife and natural resources if we are to meet our 2020 targets. It is becoming clear that we will need more integrated policies and knowledge to achieve our aim of living well within the limits of our planet, which is the long-term vision of the 7th Environment Action Programme,” said Hans Bruyninckx, EEA Executive Director. Looking beyond 2020, much greater change will be required to achieve the EU’s 2050 vision of ‘living well within the limits of our planet’, the report says. This will require more ambitious environmental policies and a more fundamental transformation of the key systems that support our society, like food, energy, housing and mobility. The report stresses the need for more integrated policies and knowledge to achieve this long-term vision. For references, please go to https://www.eea.europa.eu/highlights/more-action-is-needed-to or scan the QR code.